The Energy Innovation Center in Rutland, Vermont, contains office and educational space. 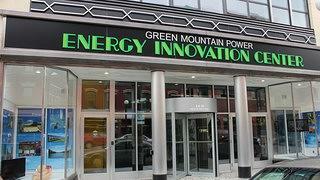 Green Mountain Power (GMP) sent a jolt through Rutland, Vermont, in 2012 when it decided to renovate a ramshackle department store to house its new Energy Innovation Center. The Energy Innovation Center opened in the space in late November of 2013, earning a LEED Gold certification the following May. It occupies the shell of a 1925 Art Deco building with a smaller, older annexed edifice from the 1860s. Chock-full of hazardous materials, the structure had sat vacant for almost 10 years. But a strong foundation, well-preserved concrete walls, and heavy steel joists and framing gave it the potential to be the ideal space for GMP. The Center also embodies the company’s innovation- and sustainability-focused values. The retrofit includes a rooftop photovoltaic array and solar-powered exhaust fans, among other green features. Extra insulation improves energy efficiency without changing the building’s historic appearance. The exterior received its own face-lift to reflect the changes within. Cracks in the terra cotta facade were carefully patched with epoxy, and aluminum architectural details, as well as a new, bright green sign, were added to enhance the Art Deco appearance. “They wanted some ‘wow’ in this building, something to attract some attention,” says project architect Ralph Nimtz of NBF Architects. This story originally appeared in the Spring 2014 issue of Preservation magazine.